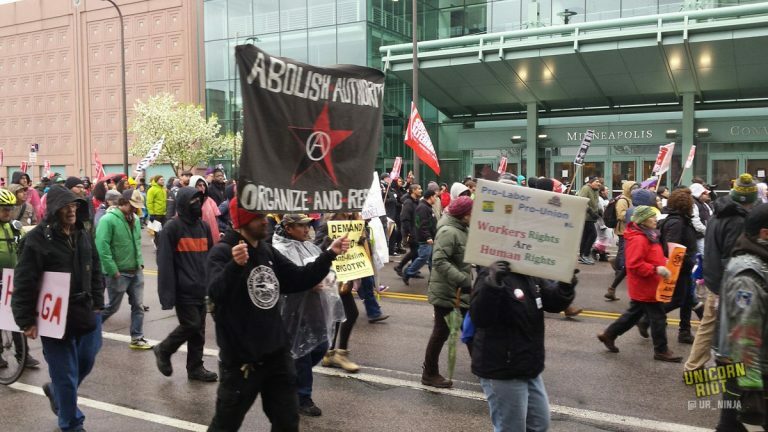 At the International Worker’s and Immigrants Rights Day march in Minneapolis, “security” (protest marshals, aka peace police) was provided by a variety of leftist organizations. Among them, the Anti-War Committee. During the march, a man in a black bomber jacket that said “Polizei” on the back and was wearing a black “Make America Great Again” hat. He and a friend with long brown hair, glasses, and a brown jacket, were taking pictures of people in the march and taunting them. When anti-fascists approached the man to give him a good ol’ Richard Spencer to the face, march marshals immediately intervened. He spent the rest of the march being followed by anti-fascists and protected by marshals from the Anti-War Committee and the Minneapolis police. March marshals accused anti-fascists in the crowd of “endangering people of color” while POC were among those confronting the fascist, not to mention the obvious threat a white supremacist taking pictures of people at an immigrant’s rights march poses to POC. The MAGA hat fascist and his brown coated friend were able to leave the march entirely untouched, with a smug grin on their faces satisfied with having successfully taunted people and taken pictures during the march. So, Anti-War Committee, we have a problem obviously. You see, we don’t like it when fascists are on our streets. We especially don’t like it when fascists are threatening people in our communities by trying to take pictures of them to target them for possible online harassment/trolling or even violence? (Not to mention the possibility of migrants that may or may not have papers being reported to ICE by these scumbags.) Which side are you on, Anti-War Committee? Are you going to keep protecting fascists? Are you going to keep endangering the lives of people of color, migrants, queer folks, and anti-fascists? Are you going to keep peace policing anarchists because it “distracts from the message” of your march on a holiday commemorating a bomb being thrown at cops during a citywide general strike for the 8 hour day? Because if that’s the case, we can’t promise that we won’t lump you in with the fascists, and the only thing some of us love as much as knocking out a fascist is acquainting a Stalinist with the business end of a baseball bat. Watch your backs, AWC. You’re on notice.